Lyme disease is the most common vectorborne disease in the United States, but it’s also mostly confined to a small swath of the country running down the eastern seaboard to the Mid Atlantic and along the Great Lakes. But while it was once thought that Lyme disease rarely occurred outside of the Northeast, a new report from the Centers for Disease Control confirms that Lyme is slowly expanding its geographic footprint. In 11 states that neighbor the 14 states where Lyme disease occurs frequently, the report found a significant increase in the number of confirmed Lyme cases. 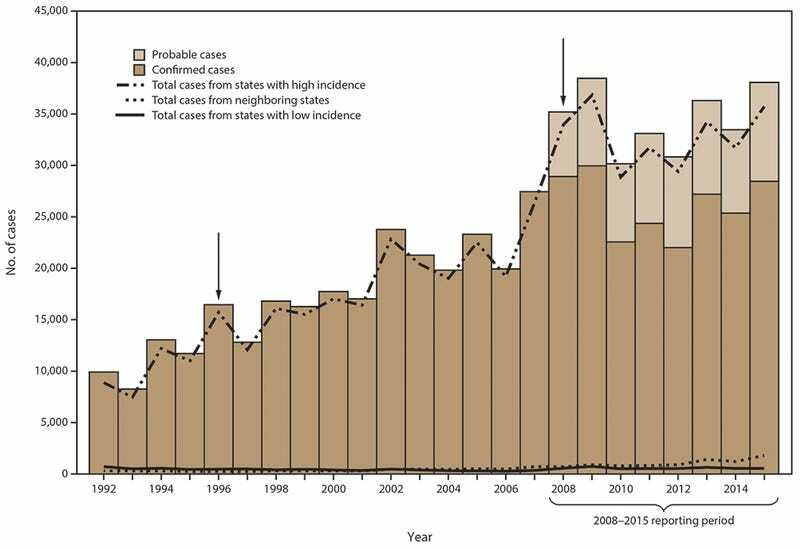 Since 1991, when Lyme was first identified as a significant problem in the US, the number of annual cases has just about tripled. In recent history, somewhere between 30,000 and 40,000 cases have been reported to the CDC each year. Typically, ticks contract the disease from white-footed mice while still larvae, then pass it along to humans, deer, and other mice when they bite. It can be a brutal disease. If left untreated, it can spread to the muscles, joints, the heart, and even the brain. Some patients seem to suffer symptoms their whole life. It can be difficult to diagnose, hard to treat, and is often ignored. The new CDC report suggests that in states where Lyme frequently occurs, prevalence of the disease seems to have stabilized, though it notes that this could be a result in changes of reporting and analysis practices. The disease’s geographic spread, though, is more concrete. The expansion in areas with substantial occurrence of human Lyme disease lines up with increases in the number of counties in those regions with established I. scapularis tick populations. Lyme-carrying ticks have now been found as far south as Florida. Between 2005 and 2015, the number of confirmed Lyme cases in what the CDC calls “neighboring states” increased by an average of six perecent. In some neighboring states, the rate at which it occurs doubled, due to changes in climate and the movement of Lyme-carrying animals. While it’s clear that Lyme cases are growing in both number and geographic expanse, it’s less clear what to do about it. Researchers are torn as to the long-term effects of the Lyme-causing bacteria, and, subsequently, on the best way to treat it. There is no vaccine. For a long time, there was resistance among doctors to believe th Lyme even could occur south of the Mason-Dixon. What the CDC report makes clear is that Lyme disease certainly isn’t going away any time soon.